#30 Lists Registration & Giveaway! Hi friends! I’m excited to announce that Registration for the September 2015 round of 30 Days of Lists is Now Open! I hope you’ll join me in the fun! If you haven’t already done so, just click on the image below, it’ll take you to my affiliate registration link. I have a great giveaway, happening now, for all U.S. 30 Days of Lists participants. Details on how to enter to win this fabulous Neendori, insert by Yellow Paper House and planner clips by yours truly, are on the private 30 Days of Lists blog, which you’ll get access to once you register. You must be already registered for the listing challenge to enter the giveaway. The winner will be selected and announced on August 22nd. You’ll have it in time for the list challenge to begin on Sept 1st! Hope you’ll list with me and good luck to all who enter! Yes, you read that correctly… “winners”, there are TWO winners in the Choose Happy Giveaway! Brave Girls Club sent me a copy of Choose Happy with my enrollment to Soul School, So I’m sharing a double dose of happy with TWO Art & Whimsy Followers! The winners are Karen J. McLean and Gale Gibbons! Congratulations to you both and a big, warm thank you to everyone else that entered the giveaway! Thank you all for following Art & Whimsy! I have something wonderful to share with you today. Brave Girls Club has published a new book that’s just chock full o’ happy and I’m giving away a copy to one lucky follower of my blog! The pages of this little book feature the beautiful artwork of Melody Ross and her inspiring messages of truth, strength and love that encourage the reader to make the conscious decision to “Choose Happy’. For more information about Brave Girls Club, who they are and what they’re about, I encourage you to stop by their website, HERE. Ok, so how do you win your own copy of this little gem? To enter the giveaway you Must be actively following my blog at ArtandWhimsy.net through either email or WordPress AND leave a comment on this blog post. Follow me on Twitter, Facebook, Instagram or Pinterest?? Sweet, you can get extra entries! Just mention in your comment, here, what other social media sites you follow me on, and be sure to leave your screen name for those sites. I just may want to follow you back! This giveaway is open within the US only and will run until Friday, May 15th. The WINNER will be announced on Saturday, May 16th. Please make sure that you leave a way to be contacted. Thanks for following Art & Whimsy and good luck to all! **Closed** Happy Painting – Giveaway!! And The Winner Is: Joanne! Congratulations, an email has been sent. Happy painting to you!! I have exciting news for you all. I just signed up for Juliette Crane’s upcoming online class, “Happy Painting – A Mini Course” and have decided to take one lucky Art & Whimsy follower along for the adventure!! To enter the giveaway you Must be following my blog at ArtandWhimsy.net AND leave a comment on this blog post with a tip for the new artist; advice for someone just starting out. This giveaway is open worldwide and will run until Saturday, April 10th 11:59 pm pst. The WINNER will be announced on Sunday April 11th before noon! Please make sure that you leave a way to be contacted. **Closed** 30 Days of Lists Giveaway!! A cheery hello to my lovely followers. I’m excited to share that registration is now open for the March 2015 round of 30 Days of Lists and I’m ready to get started! I’ve received a fair amount of questions and messages about my past lists, people wanting to know what it is and how they can participate, so I thought why not invite you all to join me and throw in a Giveaway at the same time! Yes, that’s right, I’ll be hosting a giveaway for a paid registration to March’s #30 Days of Lists to one lucky follower of my blog, courtesy of ArtandWhimsy.net. To give the winner time to plan and prep their base for listing, this will be a quick giveaway, with the winner being announced on Monday February 16th! If you aren’t familiar with 30 Days of Lists, more information can be found HERE. If you’re an eager beaver like me, and just can’t wait for the giveaway, feel free to register HERE for just $10.00. So what is 30 Days of Lists and why do I do it? It’s a daily listing challenge that runs for 30 days. Amy & Kam provide us a daily challenge, then we make of it what we want. Whether it’s a quick list, jotted down on a notepad between errands, or something more elaborate incorporated into an art journal or scrapbook album, #30Lists is a very doable challenge to keep up with. I don’t always have oodles of time to devote to arting, so this is a fun way for me to take 10-15 minutes out of my morning to get that creative energy flowing. I find that it really helps start my morning on a positive note. Just this morning I made the tag you see at the top of this post with the reasons why I enjoy listing. More examples of my past lists can be found HERE. You can also follow me on Pinterest or Instagram; I’ll post my lists there daily, once the challenge begins on March 1st. As a final note, I’d like to mention that I’m not affiliated with 30 days of Lists in any way, it’s just a challenge that I’ve participate in for 3 rounds now and have really enjoyed. To enter the giveaway you Must be following my blog at ArtandWhimsy.net AND leave a comment on this blog post telling me why you’d like to participate in #30Lists or why you have in the past. This giveaway is open worldwide and will run until Monday February 16th, when the WINNER will be announced! Please make sure that you leave a way to be contacted. Thanks for looking and good luck to all! 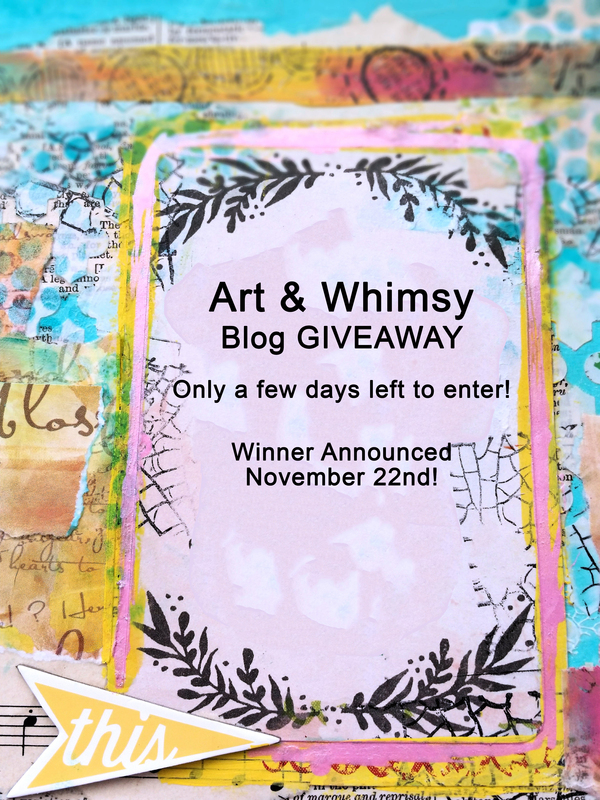 Just 2 Days Left To Enter The Art And Whimsy Giveaway! We’re giving one lucky follower a spot in the Documented Life Project Cover Story workshop! The winner of the Documented Life Cover Story workshop will be announced Saturday, Nov 22nd. If you haven’t entered yet, there’s still time! To Enter: You Must be following the blog at ArtandWhimsy.net AND leave a comment on the blog post HERE telling us what having a creative outlet like art journaling, scrapbooking, etc has done for you. To find out more about The Documented Life Project or the Amazing ladies at Art to the 5th, it can be found Here.